For the past few weeks I have been reviewing produce delivery services in The Bay Area. I have chosen a different company each week to review. At the end of ten weeks, I will provide a comprehensive ranking. I had wanted to try out Imperfect Produce since I moved to the West Coast. I had read about the company, more specifically about their mission to reduce food waste and improve environmental sustainability. I had also heard it was an affordable way to stock up on fruits and vegetables. I was excited to start building my Imperfect Produce review box and to learn the ins and outs of the company. There is a different model that Imperfect Produce employs than other delivery services I have subscribed to. The company works closely with over 150 farms and producers. They buy fruits and vegetables from the farmers and then sell to customers. The produce items sold are among those that usually end up as waste due to one of the following imperfections: size, asymmetry, scarring, lack of consumer market, surplus, or discoloration. Imperfect Produce notes that there are 3 billion pounds of produce going to waste per year in the state of California alone, even after food banks and animal feedlots take from it what they want to use. What a staggering number! Before I built my Imperfect Produce review box, I checked out the FAQ page which provided a ton of information. Their overarching mission is to reduce food waste. They work with farms all over to deliver produce that is good for the individual and the planet as a whole. Imperfect Produce prices their produce per pound, so the final price of my box depended on the final weight of the contents I selected. For this Imperfect Produce review, I opted for a medium box of the organic fruits and veggie as my base and built up from there. Customization is a large part of the process at Imperfect Produce, and it is the name of one of the headings located front and center on the home page (Customization 101). 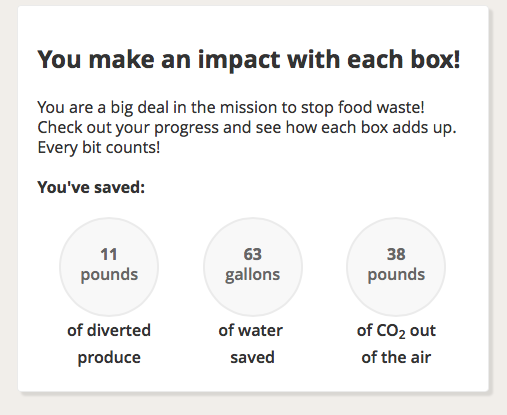 Upon check out and up to three days prior to my delivery, I could add and subtract any amount of produce to my Imperfect Produce review box. Of course, since the produce is charged by the pound, the more you add and the less you subtract, the more expensive your box will cost. If one does not wish to spend time customizing, Imperfect Produce provided a pre-built box with a solid variety of produce based on the size of the box selected (see average box weights listed above). Imperfect Produce lists the origin of each item and the reasons why they have been deemed imperfect, or unfit for retail. The website provided meal plan and storage tips, and provided categories of produce based on length of shelf-life to accommodate the cooking schedule of the individual. This furthers Imperfect Produce’s mission of reducing food waste and rotting food in the fridge. Imperfect Produce delivers to the Bay Area, LA, Orange County, Portland, Seattle, and Chicago, with plans on some serious expansion down the road. A good thing to note is that Imperfect Produce charges a delivery fee, ranging from $2.99 to $4.99, depending upon location. This is not mentioned in the advertised price, but something of note once check out time comes along. When I placed my order for my Imperfect Produce review, I immediately received a confirmation email. The email provided links to customize my box, to refer a friend and receive a $10 credit, and to view featured recipes. All in all I received 21 items at roughly $25, plus a $2.99 delivery fee. Here are the items I received as part of my Imperfect Produce review box. Large Lemons: Two in total, even in color. They were on the softer side. Organic Ginger: Two large pieces that arrived in great condition. Organic Artichokes: Two that were of a nice uniform color, good size and firm. They were a bit brown at the top, but nothing out of the ordinary. Organic Mini Watermelon: Two in total - definitely mini but substantial and just ripe. Organic Grapefruit: Two in total - nice shape and color. A bit smaller in size. Organic Mandarins: Two in total - good in size, a bit soft. Organic Cucumber: One firm and nice-sized cucumber, although shaped like a candy cane. Organic Apples: Smaller in size, three in total. Organic Small Avocados: Three in total, not quite ripe. I can never have enough avocados. Organic Kale Bunch: Two extremely full bunches of solid green leaves that were sturdy and wide. The majority of items I selected for my Imperfect Produce review box were pretty easy to prep. I gave a few slices to my mini watermelon, and once all chopped up, I stored the cut fruit in a glass container for an easy and hydrating snack. I have been breaking up a piece of ginger, pealing it, and chewing on it every morning which I have thoroughly enjoyed. The ginger really opens me up from the inside out, especially in my chest and nasal passageways, and I have noticed that after a few days of daring the spicy root I have been able to tolerate it better. I have been adding a squeeze of lemon to enhance the flavor most meals, so these will follow suit using the two fresh citruses I received. And as always, the oranges and apples will serve as great midday snacks to provide me with a boost of energy when I need it most. I incorporated a few of the ingredients into some fantastic meals and snacks this week. Always a dish that delivers warmth to the heart and soul, I built this paella starting with slow roasted mushrooms, peppers, a shallot, vegetable broth. and white rice. I then grabbed one of the two large bunches of kale I received as part of my Imperfect Produce review box, separated the leaves from the stem, and gave them a rough chop. After a quick sauté in a separate pan, I topped my almost-ready paella with loads of the greens. Four small divots made room for four eggs, one in each. I baked this in the oven for about 8 minutes until the eggs set. My favorite part of paella is the crispy rice and this version did not disappoint. An easy snack that also doubled as a small dinner one night, this guacamole had tons of flavor and a healthy dose of good fats. I placed some carb-free scoopers in the form of raw cucumber slices on the side. I diced up my avocados, smashed about 1/2 of them with the back of a fork, added some quartered cherry tomatoes with cilantro, lemon juice, salt and pepper, and got to dipping. The crunch of the cucumber made for a great chip substitute. Seriously could not be simpler and no special kitchen equipment required. I took one of the artichokes, pulled off the bottom layer of leaves, and snipped off the rest of the sharp tips. After boiling some water in a large pot, I dropped the whole vegetable inside, covered it, and reduced to simmer for about 30 minutes. Once I was able to easily pull off a leaf with a pair of tongs, I knew the artichoke was ready to serve. I squeezed some fresh lemon juice onto my leaves and dunk each one into some seasoned olive oil. I prefer oil over melted butter, but either is a fine choice for artichoke leaf dipping. Imperfect Produce employs a different method than with other produce services I have tried. The company works with many different farms and delivers produce that is unable to sell in to stores for a variety of reasons, mostly aesthetic ones. I was unsure what to expect when I received my box: would my produce items look THAT different? What about the taste? Would it be up to par? Upon receiving my box I did not find any jarring imperfections. The produce I received looked extremely similar to that which I have seen on shelves at the grocery store. In many cases their appearances looked even better. Everything tasted fantastic and arrived ripe. The Imperfect Produce platform was almost as if I was online grocery shopping, as there were a ton of familiar items to choose from. The communication from Imperfect Produce was top notch as well. I received text messages throughout the delivery process. I enjoyed being able to add and subtract items to customize my box. I learned where my produce was grown and also the reasons why the items were deemed imperfect.